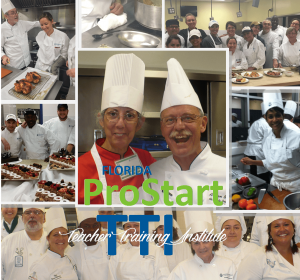 ProStart Teacher Training–Last Month to Register! TTI is divided into four years of participation. FIRST YEAR ATTENDEES focus on the Foodservice Industry, Culinary Techniques and Methodology, Food and Workplace Safety as well as Stocks, Sauces and Soups. THIRD YEAR ATTENDEES continue their ProStart Teacher Training experience in Marketing, Cost Control, Desserts, Baked Goods, Global Cuisines and Ingredients with a strong emphasis on the art and craft of teaching in a culinary setting. FOURTH YEAR ATTENDEES rotate every other year between Nutrition and Baking & Pastry. The 2019 Year Four curriculum will be NUTRITION. CLICK HERE to register. Registration deadline is May 3, 2019. If you are administering the ServSafe or ProStart exams for the first time, or need a refresher, we have resources right here on our website for you! Administer ProStart; This page also contains the steps to earn the ProStart Certificate of Achievement (COA). The FRLAEF awarded $92,000 in scholarships during the Salute to Excellence Awards dinner on Saturday, March 2, 2019 at the Rosen Plaza Hotel in Orlando. In order to redeem their scholarship, the awardees must provide the FRLAEF with their post-secondary Student ID number and Financial Aid mailing address of the school they will attend. Students must be pursuing a degree in foodservice or hospitality. This information is due no later than June 14, 2019. A few Florida ProStart schools are in the process of remodeling their facilities. If you have recently remodeled and are interested in sharing your floor plans and/or pictures, please email them to us. A county is looking for ideas before beginning their own culinary renovations. Marion County Forest High School in Marion County is in need of a culinary teacher. For more information CLICK HERE and then look for the Careers tab at the top right corner to apply. Citrus County Citrus High School in Citrus County is in need of a culinary teacher. CLICK HERE then scroll down to “Teacher Culinary Arts” for more information and to apply. Lecanto High School in Citrus County is in need of a culinary teacher. CLICK HERE for the application. ICYMI–CLICK HERE for 2019 results and competition video. The National Restaurant Association Foundation, in partnership with PepsiCo Foodservice, is proud to share the seventh Project Taste Test “Servin’ Up Successful Careers” video. Project Taste Test is produced exclusively for ProStart classrooms to give students advice from the best in the business and to showcase the limitless opportunities in restaurants, foodservice, and hospitality. This year’s Project Taste Test video features an exclusive interview with Stephen Joyce, CEO of Dine Brands Global; Darren Rebelez, President of IHOP; and John Cywinski, President of Applebee’s. They are interviewed by Sidney Reed, a ProStart alum from California who is now attending Cal Poly Ponoma to pursue a career in the restaurant and hospitality industry. Show this video to your students and they can complete the interactive classroom worksheet. The worksheet includes a short project where students can use social media to build out their own marketing campaign. Click here to watch PepsiCo’s Project Taste Test video. Educators can access the interactive classroom activity by logging in to educator hub. SafeStaff is a performance measure for Perkins funds. Please turn in your SafeStaff results to the same person you turn in your ServSafe results. www.floridashines.org is the host sight for MyCareerShines. This website exist to help students earn a college degree and find a bright career. They work closely with Florida’s 40 colleges and universities. Students can check their transcripts, explore libraries and track their success. There are student log in options as well as parent log in options. Don’t forget www.goprostart.com. They have practice exams for ProStart and ServSafe. The exams are broken down into three optioins: 15 questions (Sampler), 80 questions (Entrée) or 45 questions (Dessert). The 1st edition of Foundations of Restaurant Management and Culinary Arts distributed by Pearson is going out of print. Pearson is no longer selling the printed answer sheets and online exam vouchers. However, the National Restaurant Association will continue processing the answer sheets. You may reach them by email at cte@pearson.com or call 800-848-9500 prior to that date. However, as of January 1, 2019, you may purchase these 1st edition exam items directly from the National Restaurant Association. Please contact your Foundations rep or email textbooks@restaurant.org for 2019 orders or to learn more about the new 2nd Edition of FRMCA. Pinellas County Schools shared their Culinary 1 – 3 progression chart. This chart was created to visually show the progression of learning throughout the frameworks. This chart is a work in progress and is reviewed yearly. CLICK HERE to view it. NRA Solutions team worked with Turning Technologies to host a ExamView webinar recording via the developer’s ftp site. The recording is not as intuitive or elegant as we would like it to be, but I believe it can still help teachers learn the ropes. NRA Solutions can also do 1:1 support for any of your teachers interested in the 2nd edition or currently using ExamView, just let us know and we will connect you to them.